Is Your Air Conditioner Running Efficiently? Here in the Southwestern part of the country air conditioning is a requirement. With temperatures running above 100 degree’s for weeks at a time, these systems can struggle to perform as necessary to keep you and your family cool. Besides filters, there are a few other things that are worth mentioning. If you think you may have a problem, it will probably be showing up in your electric bill as either you or your system is having to compensate for its inability to perform as required. Canvas your neighbors about their electricity usage as a comparison. Talk to folks that have simular houses and life styles for a good comparison. Square footage, thermostat settings and occupancy times are all important. Differences of more than 20% can be a clue there may be an issue. Also, use energy numbers or kwh as listed on the electric bill not the actual dollars spent. Here in Texas, the electricity is deregulated and there could be 2 to 5 cents of difference in kwh per hour charges. If your system has operated properly in the past, these inspection and preventative maintenance items will ensure optium performance. However, if your system has never worked properly or struggeled to keep the house cool, you may have design or service conditions that may warrant a call to a professional. Either way, by inspecting and maintaining the obvious you are isolating the issue allowing the trained technician more time to fix the problem less time to find it. Clean air filters: Replace the air filter 2 to 4 times a year. See my complete article for details. Heating/Cooling Air Filters. Air Returns:Keep these vents clean from dust debris and any obstruction. Depending on the design, the return air vent(s) may be close to the floor or in the ceiling. If the air return is near the floor, remove the metal grid and use a vacuum cleaner to remove all the dust and debris. If you have an air filter located here, replace it as necessary. In some cases you may have a filter here as well as at the unit. If so, this filter should be replaced on the same schedule as your normal filter. Room Temperature: A well designed central air conditioning system should provide balanced air flow and temperatures of no more than about 3 degrees in difference from one room to the next. Large windows and doors will impact that number to some degree. Air Flow: With air registers in each room, the air must circulate from the room to the return air location. For this reason, the air must be able to exit the room with the door closed. Either the door will (should) be undercut or there may be a pass-through return vent into a hallway or another room. If doors slam themselves shut (when the system is running), you may have a return air issue. TIP: If you recently added new carpet to your house, and you are now having air conditioning problems, the new carpet may not be adequately allowing the air to return under the doors. System Temperature Differential: This test is similar to checking your blood pressure as variables can effect the results. Most professionals set the thermostat low enough to require the system to run constantly (8 to 10 degrees below ambient) for at least 30 minutes (run it longer if you can). Use a digital thermostat to validate the air temperature exiting the register. Do not go by the temperature of the register itself. Its the air temperature you need. Do the same at the make-up or input air. You should have a temperature differential of 14 to 20 degrees in difference. Too high or too low is a symptom of a larger problem. High numbers indicates a 1) dirty filter, 2) improper/inadequate duct-work, 3) a fan not spinning fast enough or undersized. A low number indicates 1) refrigerant loss, 2) a dirty coil, 3) overworked compressor, 4)over-sized fan, or 5) deficient/blocked return air system. Check the obvious, then contact an HVAC specialist. Water Pan and Condensate Drains: In the process of the cooling the house, the evaporator coil inside the air handler unit (located in a closet, attic or basement) can pull humidity out of the house envelope. In doing so, that water collected by the system has to be expelled. By design, a drain is connected to the unit and released outside. This drain tube must stay clean of debris, otherwise it can back up and cause water to drain into the house causing damage to Sheetrock and overtime to the building structure. They don’t drain all the time so just visually seeing water dripping is not a good enough inspection. Once you locate the drain, use a Wet/Dry vacuum cleaner to attach to the pipe (at the end, outside the house). Seal it as best as possible and run the vacuum for a couple of minutes. This should pull any bugs, lint, dust or debris out of the pipe. This is a better method than pouring water through the system, and a lot less messy. Perform this function at least once a year. Outdoor Compressor: Ensure plant material is clear of the compressor (18″ to 2′), remove leaves, grass, vines by hand. Use your water hose to spray down the coils to remove lint dust and dirt. This is probably one of the most important quick solution to a system that is under performing. 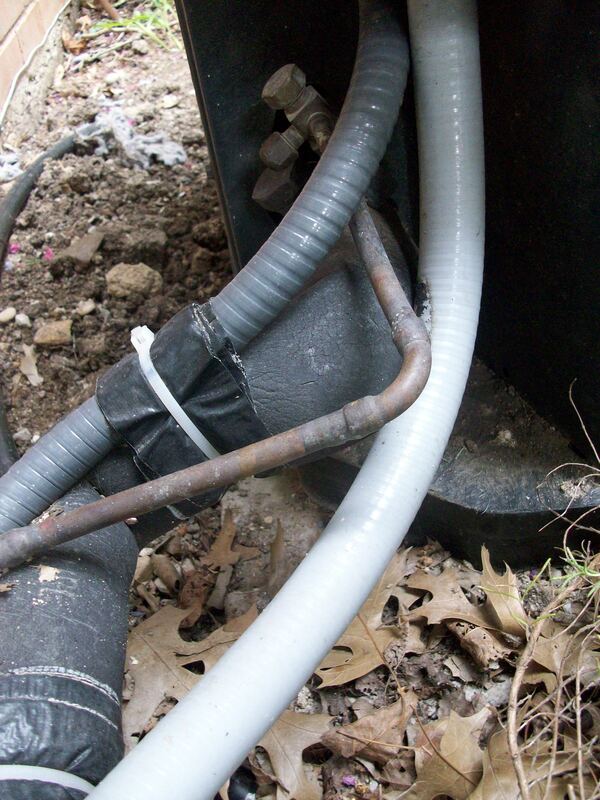 Outdoor Compressor Connections: There should be two copper pipes and one maybe two electrical conduits. The larger of the two (suction pipe) copper pipes should be properly insulated (all the way to the air handler/evaporator coils in the house. This pipe is delivering the cold freon used to cool the house. The longer it can stay cold, the better. Also look at the electrical connections to ensure they are sealed (sealtite type conduit) and secure. There will also be a small low voltage wire that may or may not be in a conduit, make sure it is not cut chafed or deteriorated. Air Ducts: This item deserves an article on its own. Independent studies have shown up to 35% loss in cooling capacity due to poor duct insulation, leaky ducts, leaking air vents and duct splicing. Inspect for air leaks throughout the entire system. All of these components that make up the delivery system should be sealed with the highest degree. Use Aluminum faced tape or mastic paint rated for UL 181 applications to seal any holes. DO NOT USE FABRIC BASED “DUCT” TAPE. TIP: If you are considering replacing your HVAC system look seriously at replacing the duct work as well. Poorly insulated ducts can reduce your SEER rating by 50%. Set Back Thermostat: If you don’t have one, you need one. This is one of the most effective ways in managing your heating and air conditioning requirements and costs. Basically, you program it to change the temperature automatically to meet your lifestyle needs by adjusting the temperature for periods when the house is not occupied. Regarding the maintenance? Most are battery equipped and you should change it once a year. Attic Insulation: Inadequate attic insulation can also effect the performance of your system. Use this US Gov link to determine if you have enough insulation for your region. Use a straight edge or yard stick to measure the insulation in various places. Avoid compacting it or stepping on it any more than you have to. Use a rake to re-spread and fluff the insulation.